In CDMA system, m-sequence and Gold codes are often utilized for spreading-despreading and scrambling-descrambling operations. 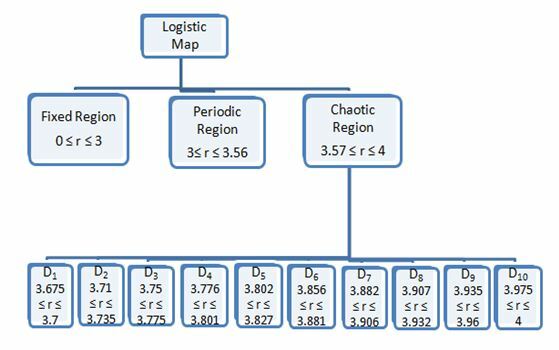 In a previous work, a design framework was created for generating large family of codes from logistic map, which have comparable autocorrelation and cross correlation to m-sequence and Gold codes. The purpose of this work is to evaluate the performance of these chaotic codes in a CDMA environment. In the bit error rate (BER) simulation, matched filter, decorrelator and MMSE receiver have been utilized. The received signal was modelled for synchronous CDMA uplink for simulation simplicity purpose. Additive White Gaussian Noise channel model was assumed for the simulation. Code Division Multiple Access (CDMA) capacity is dependent on a number of factors, of which spreading code plays a crucial role (Meenakshi & Chawla, 2014). Lot of efforts has been made towards developing optimal codes both for synchronous and asynchronous CDMA. The m-sequence, Gold sequence and Kasami sequence that are currently used asynchronously in CDMA, all have limitations. M-sequence has small set and poor cross correlation; Gold codes have poorer correlation than m-sequence, but larger set. Small Kasami has better correlation than Gold, but small set; while large Kasami has poorer correlation values than Gold, but contain more sequences (Meenakshi & Chawla, 2014) (Sawlikar & Sharma, 2011) (Pickholtz, Milstein, & Schilling, 1982). The essence of this research work is to create a framework for generating large sets of optimal codes for asynchronous CDMA. Recent researches have shown that apart from linear shift registers sequences (m-sequences, gold sequences etc), chaotic sequences have good correlation properties and large family size (Umeno & Kitayama, 1999) (Vladeanu, Banica, & Assad, 2003) (Zhang, Guo, Wang, Ding, & Chen, 2000). The low autocorrelation side-lobes of these chaotic sequences allow for easy synchronization with the receiver; while the low cross correlation reduces the multiple access interference. They have been considered as good candidate for application in DS-CDMA system. In (Adetoyi & Adeniran, 2016), we presented a method for generating chaotic sequences by exploiting the bifurcation control of the logistic map. The BER performance of these bifurcation dependent sequences, in a DS-CDMA environment, is exploited in this paper. where p = 1 is the parent map. It was found that the balance property of the sequences produced by both methods was worse than Gold sequences or Kasami Sequences, except the period is very large. The sequences were considered good candidate for CDMA and W-CDMA. It is doubtful if large family can be realized. Two thousand sequences having one million bits length were subjected to NIST randomness test and nine test results were presented. The proportion of sequences that passed the test at a significant level (α) of 0.01 is at least 98.6%. The sequences are considered good enough for secure cryptosystem. In (Spinsante, Andrenacci, & Gambi), De Bruijn sequences generated from combinatorial mathematics was presented. Although the family size is large, the generation process is complex. The analysis was shown only for De Bruijn sequences with a length of 32 bits. The normalized radar ambiguity diagrams of De Bruijn and the chaotic sequences was compared, the differences in their performance, with respect to distance and doppler resolution determined by the main peak level, and the sidelobes level on the plane, were not significant. Results show that in some scenarios, and with given assumptions, De Bruijn sequences may provide improved performance with respect to systems adopting chaotic sequences. It was suggested that it can be used in DS-CDMA if the correlation selection criteria is defined, then its performance will be comparable to currently used CDMA codes. A multilevel spreading codes for DS-CDMA using ternary and quaternary Gray Inverse Gray (GIG) codes was proposed in (Usha & Sankar, 2013). The 3-level, 6-length ternary and 4-level, 8-length quaternary GIG codes obtained have autocorrelation and cross correlation that is better than Gold. The method for generation of the bifurcation dependent sequences has been fully described in (Adetoyi & Adeniran, 2016). The discrete form of the original logistic map was modified to accommodate the bifurcation control in Equation 1.
where, LT1, LT2 and LT3 are three partitions obtained from Lloyd algorithm. and n is a Gaussian random vector with zero mean and covariance matrix σ2R. from D1 domain, were utilised for simulating six users transmission. Each of the six user transmission consists of 100,000 bits of data spread by his respective user code. The transmitted data are corrupted by AWGN in the channel. The BER of logistic sequence was compared to Gold and m-sequence for the matched filter, decorrelator and MMSE receiver types, in a CDMA environment of six users as shown in Figures 6-8 respectively. In Figure 6, logistic sequence has worst BER performance for matched filter receiver; while it has best performance for decorrelator and MMSE as shown in Figure 7 and 8 respectively. In Figure 9, the BER performance of logistic sequence was considered for all the receiver types. It can be seen that decorrelator provides the best reception for logistic sequence. The spectral analysis of random sample logistic, Gold and m-sequences were conducted by taking the Fast Fourier Transform and shown in Figures 10-12. It can be observed from the result that logistic sequences show better BER performance than Gold and m-sequences for Decorrelator and MMSE receiver. Also, the decorrelator receiver proves to be an optimal receiver for logistic sequences, compared to matched filter and MMSE receiver. 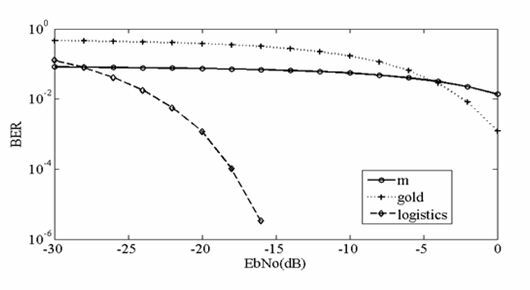 Furthermore the frequency spectrums of the logistic sequences are wideband, due to the low MSAAC values. However the spectrums of the logistic sequences are not as flat as m-sequence, but the flatness is comparable to Gold sequences. This work was supported by the Nigerian Tertiary Education Trust Fund under academic staff training and development programme. Meenakshi and M. P. Chawla, “A review comparison of different spreading codes for DS CDMA,” IJSRD – International Journal for Scientific Research & Development|, vol. 2, no. 2, pp. 995-999, 2014. 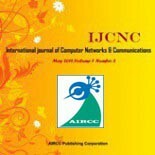 A. Sawlikar and M. Sharma, “Analysis of different pseudo noise sequences,” International Journal of Computer Technology and Electronics Engineering (IJCTEE), vol. 1, no. 2, pp. 156-161, 2011. R. L. Pickholtz, L. B. Milstein, and D. L. Schilling, “Theory of spread-spectrum communications-A tutorial,” IEEE Transactions on Communications, vol. com-30, no. 5, pp. 855-884, May 1982. K. Umeno and K. Kitayama, “Spreading sequences using periodic orbits of chaos for CDMA,” Electronic Letters, vol. 35, no. 7, pp. 545-546, April 1999. C. Vladeanu, I. Banica, and S.El. Assad, “Periodic chaotic spreading sequences with better correlation properties than convectional sequences-BER performances analysis,” in Signals,Circuits and Systems, 2003. SCS 2003.International Symposium on, vol. 2, Iasi,Romania, 2003, pp. 649-652. 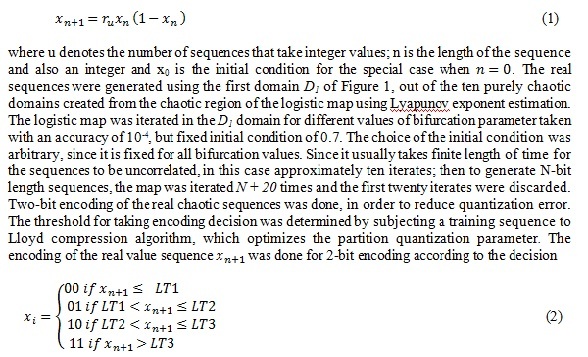 H. Zhang, J. Guo, H. Wang, R. Ding, and W Chen, “Oversample chaotic map binary sequences: Definition, performance and realization,” in Circuits and Systems, 2000. IEEE APCCAS 2000., Tianjin, 2000, pp. 618-621. O. E. Adetoyi and S. A. Adeniran, “Chaotic Sequence Derived from Bifurcation Dependency,” International Journal of Scientific & Engineering Research , vol. 7, no. 4, pp. 165-169, April 2016. N. K. Pareek, V. Patidar, and K. K. Sud, “A random bit generator using chaotic maps,” International Journal of Network Security, vol. 10, no. No.1, pp. 32-38, 2010. S. Spinsante, S. Andrenacci, and E. Gambi, “De Bruijn Sequences for Spread Spectrum Applications: Analysis and Results”. 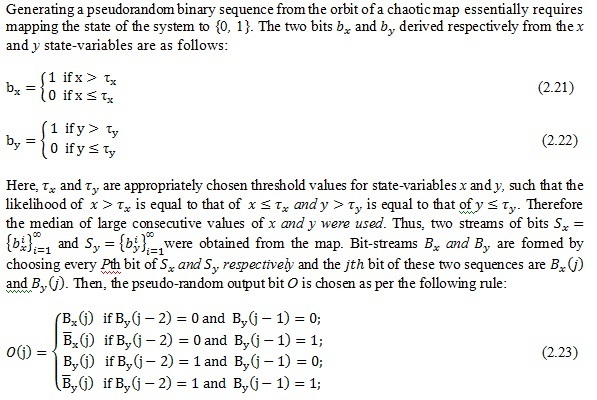 M. Suneel, “Cryptographic pseudo-random sequences from the chaotic,” Sadhana, vol. 34, no. 5, pp. 689-701, October 2009. K. Usha and K. J. Sankar, “New Multi Level Spreading Codes for DS CDMA Communication,” in Conference on Advances in Communication and Control Systems (CAC2S 2013), 2013, pp. 154-159. Y. Venkateswarlu, K. Sandeep, and A.S.N. Chakravarthy, “CDMA and MAI problem elimination methods,” International Journal of Scientific and Research Publications, vol. 2, no. 7, pp. 1-13, 2012. Z. Mahtab, S.J. 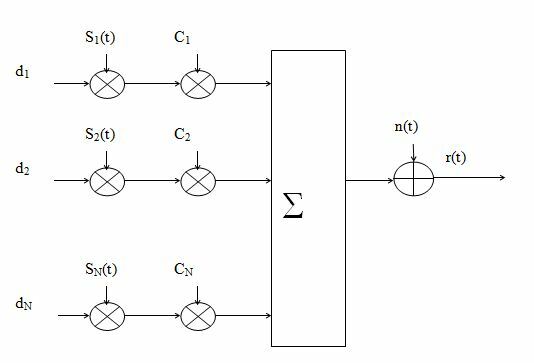 Ahmed, S.S. Hussain, and S. Hasan, “CDMA based wireless transceiver system matlab simulation and FPGA implementation,” in Engineering Sciences and Technology,2005.SCONEST 2005. Student conference on, Karachi, August 2005, pp. 1-9. Oluyemi Adetoyi obtained her B.Sc. degree in Electrical and Electronic Engineering from University of Ibadan, Nigeria. Her M.Sc. degree in Electronic and Electrical Engineering was obtained from Obafemi Awolowo University, Ile-Ife, Nigeria. She was a lecturer at different time at Adekunle Ajasin University in Nigeria and at Babcock University between. Currently, she is a lecturer with University of Ibadan, Nigeria. She is currently pursuing her PhD in Communication Engineering at Obafemi Awolowo University, Ile-Ife, Nigeria. Her research interest is in wireless communication and data security. Solomon Adeniran is a lecturer with the Department of Electronic and Electrical Engineering, Obafemi Awolowo University, Nigeria. His area of research work spans passive components for microwave networks, DSP and communication systems.